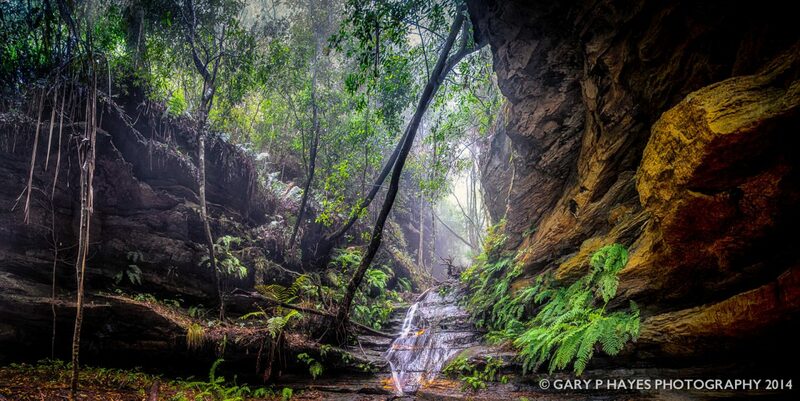 ABOUT: The Den Fenella trail is a delightful moderate descent through a fantastical victoriana fern gully with small waterfalls and bridges which then opens onto a stunning midway down view of the Jamison Valley. The lookout is actually a dead end and a small platform but there are a number of great photo ops from here, including distant morning mist and cliff views, a steep cliff vertical on the right and a postcard framed valley view. The sun comes up from the left and lights up the opposite side, but the picturesque nature of the view allows that. PHOTO EQUIPMENT TO BRING: Bring your tripod for lovely mini waterfalls on the way down including a cave waterfall near the lookout and a variety of lenses for the lookout itself. Tripod for sunrise balancing and blending. GETTING TO THE SPOT/S: Park in the main Wentworth Falls car park and walk to the right hand side and pick up the signs there. Approx 30 mins descent and 45 back.